Old Man's Beard vine smothering natural streamside habitat in Glenside. Photo: Barry Blackett. Check out this film footage of David Bellamy showing us how to identify Old Man's Beard in a retro clip from NZ On Screen Old Man's Beard Must Go! To detect and treat occurrences of Old Man’s Beard on Council and private land throughout the suburb. Look for outbreaks of OMB starting in February each year. These can be recognised by their spiky white flowers and cotton bowl type fruit. Encourage residents to report outbreaks they have observed. Treat outbreaks by tracing vines to their roots, cutting them at ground level and dosing the stumps with a herbicide paste containing picloram or trichlorpyr. Maintain a photographic record of the plants before and stems immediately after treatment. Obtain a further record of the dead plants about two weeks after treatment to confirm that treatment has been successful. Identify all outbreaks on a map of the area with an indication as to whether treated or not. Liaise with KiwiRail, Greater Wellington and Wellington City Council staff. 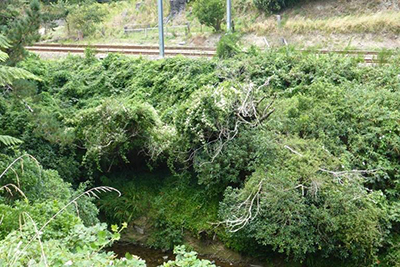 Encourage KiwiRail to spray along the Rail Corridor each Feb-March. Ask for Council support where outbreaks are inaccessible or when cutting vines at ground level is not a practical way of treatment. Record outbreaks and details of treatment on the NatureWatch website.